Beyond providing data for all 32 NFL teams, PFF also supports network broadcasters with game-preview packets that are used to enhance the in-game experience for fans and viewers. This Cardinals-Vikings preview features the same information our broadcast partners use for team research and in-game production. 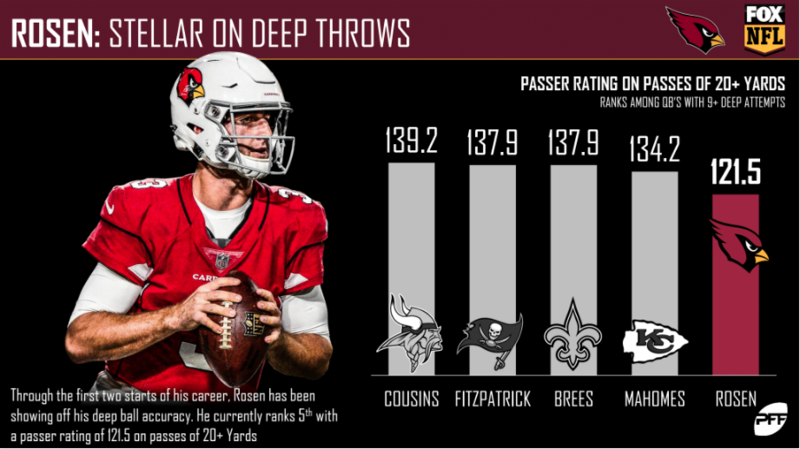 Rookie quarterback Josh Rosen has shown little fear in throwing downfield so far this season. His 9.7 yard average depth of target is tied for the second-highest mark among all quarterbacks with at least 65 dropbacks, and his 121.5 passer rating on passes of 20-plus yards is fifth-best in the NFL among all quarterbacks with at least nine deep attempts. The Cardinals’ decision to draft wide receiver Christian Kirk in the second round of the 2018 NFL draft is paying dividends. 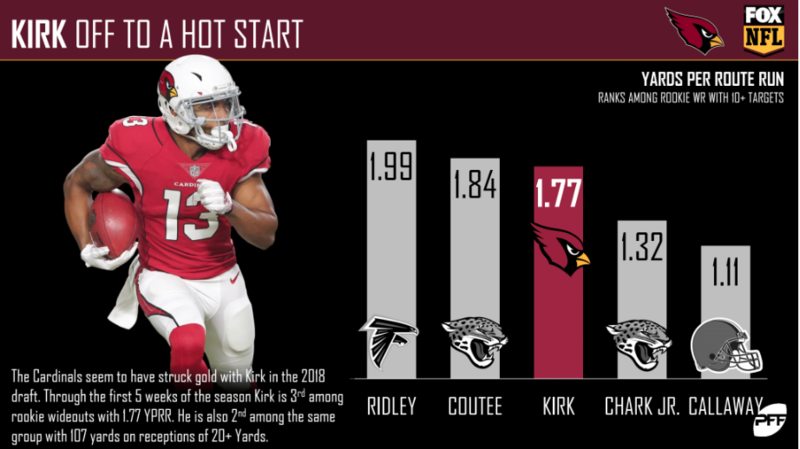 Kirk is currently third among all rookie wide receivers with 1.77 yards per route run, and his 107 yards gained on receptions of 20-plus yards is second-most among rookies. 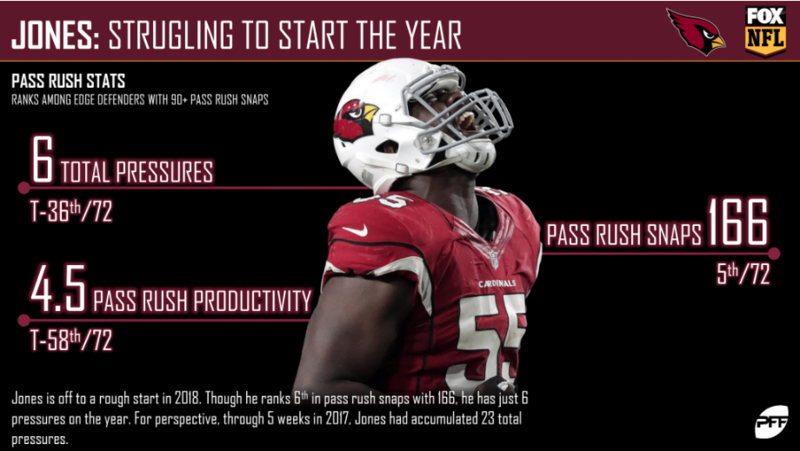 Through five weeks, Chandler Jones has had trouble replicating his dominant pass-rushing performance from 2017. His 166 pass rush snaps in 2018 are sixth-most among edge defenders, but his six total pressures are tied for 36th among 72 edge defenders with 90-plus pass rush snaps. Patrick Peterson continues to dominate his matchups, as shown by his 0.45 yards allowed per snap in coverage, the fewest among all cornerbacks with at least 150 cover snaps. He’s also allowing a reception for every 17.9 snaps in coverage, which is good for second among qualifying cornerbacks. 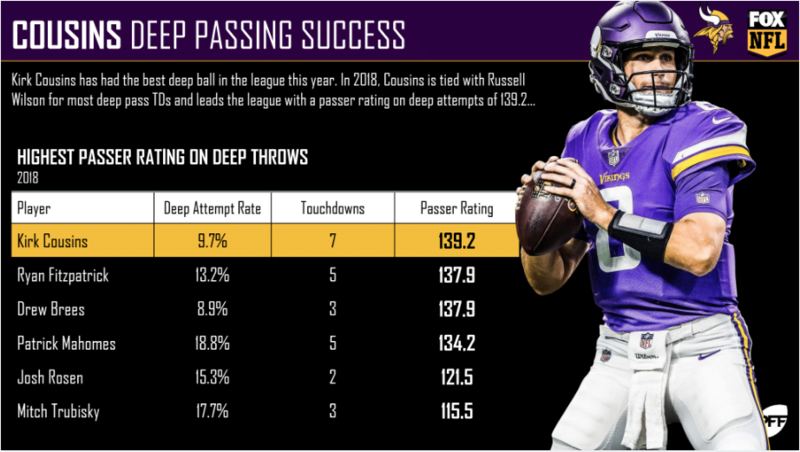 Kirk Cousins has been extremely effective when he’s thrown the ball deep downfield. His 139.2 passer rating on 20-plus yard passes is the best in the league, while his seven touchdowns on deep passes are tied for the most in the league. 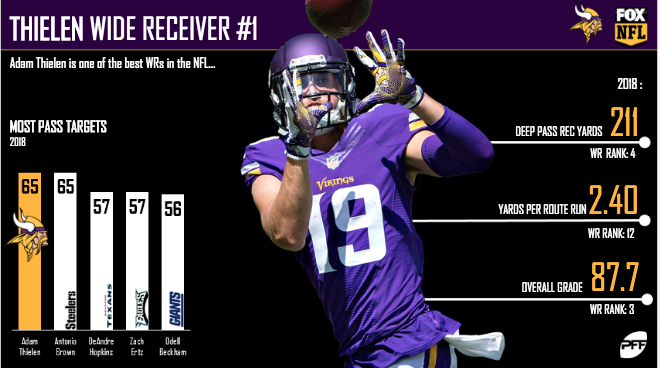 Adam Thielen is solidifying his place as one of the league’s top receivers. His 65 targets are tied for the most at his position, and his 2.40 yards per route run is the twelfth-best mark among qualifying wide receivers. He’s accumulated 211 yards from deep passes, fourth-most, and his 87.7 overall grade is third-best among players at the position. A defense’s ability to stop their opponent on third down is crucial, and sure tackling is a key component. 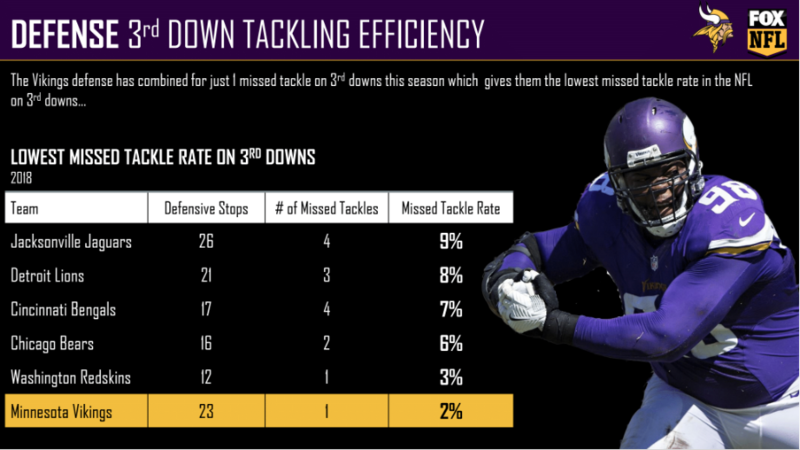 The Vikings have made 23 defensive stops on third downs in 2018, and have missed only a single tackle. That translates to a 2% missed tackle rate on third downs, the lowest figure in the NFL. 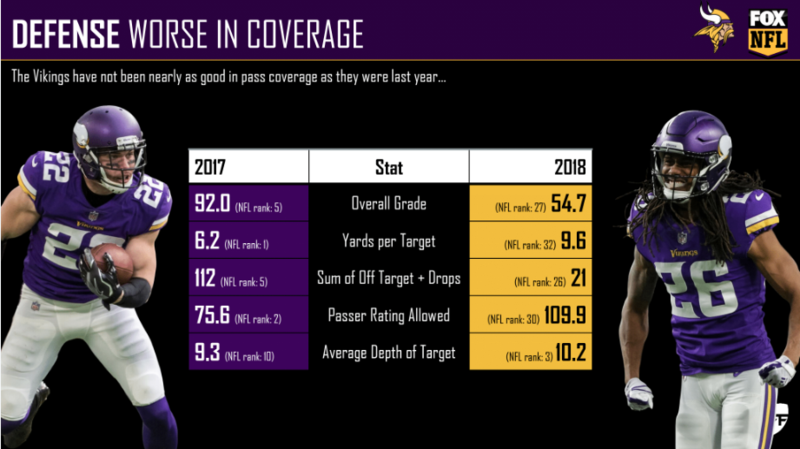 The Vikings pass defense has taken a step back in 2018 after an excellent year last year. Their overall coverage grade of 54.7 ranks 27th this year, after finishing 2017 ranked fifth with a 92.0 coverage grade. They’ve allowed 9.6 yards per target after allowing 6.2 in 2017, a concerning drop from number 1 to number 32. 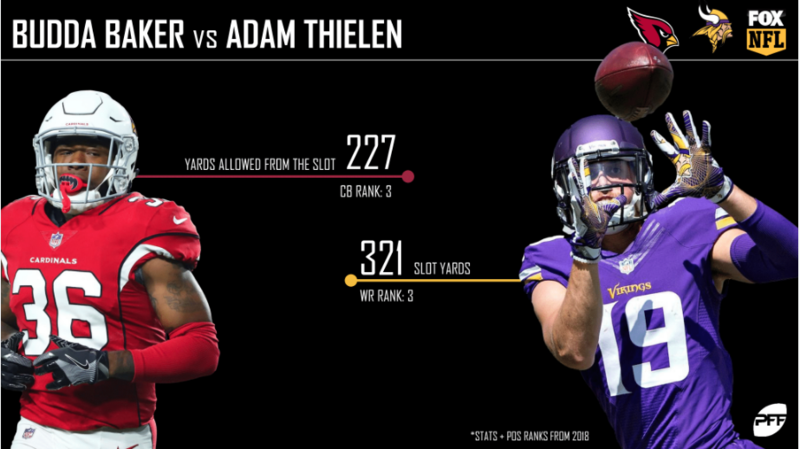 PFF Greenline has projections for the spread, moneyline and over/under of the Cardinals’ matchup with the Vikings. Get its picks here.